ACT Fibernet, India’s first Giga Internet Service Provider (ISP) and third largest service provider in the wired broadband category has doubled the data limits for all its broadband plans in Delhi. The new plans will be applicable from September 12, 2017. 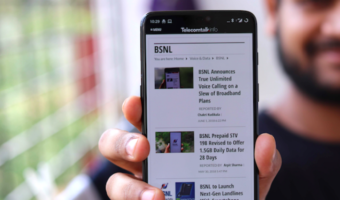 “To give customers the freedom to use data as per their needs ACT Fibernet has combined the upload and download FUP limits into one monthly data at no extra cost,” said the company in a press statement. To recall, ACT Fibernet last upgraded its broadband plans in Delhi less than two months ago. And the best part is that the customers can enjoy higher data usage at zero additional cost, meaning ACT is upgrading the data limit without any increase in the prices of the plans. Under the retail broadband plans, ACT Basic has been upgraded to 100GB FUP limit with 20 Mbps speed from 50GB FUP and 20 Mbps speed. Similarly, the ACT Bronze has been upgraded to 250GB FUP limit with 75 Mbps speed and ACT Silver has been upgraded to 350GB FUP limit with 75 Mbps speed. The popular ACT Gold broadband plan has been upgraded to 500GB FUP limit to 100 Mbps speed and lastly, the ACT Platinum has been upgraded to 600GB FUP limit with 150 Mbps speed. Take a look at the plan prices above. Similarly, under the ACT SOHO (Small office, home office) plans, the ACT Remarkable plan has been upgraded to 850GB FUP limits with 125 Mbps speed; the ACT Exceptional has been upgraded to 1100GB FUP limits with 150 Mbps speed and lastly, the ACT Phenomenal has been upgraded to 1400GB FUP limits to 150 Mbps speed. What has changed in the above plans? they seem to have added up+down stream. Other than that, … ?? You Broadband and others are gearing up for a challenge and offering more value for money. ACT looks like its “act”ing like Airtel!